There is a new club rolling into Kwantlen; one with two wheels, spandex and shaved legs — well maybe not the spandex and shaved legs. 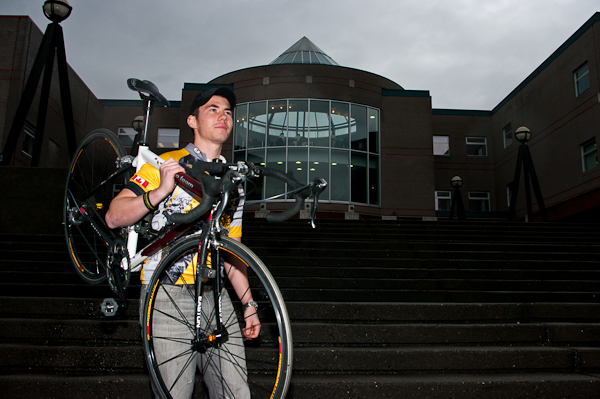 The Hotwheels cycling club is Kwantlen’s newest addition and is gearing-up to get more students onto bikes. Stephan Struve, a fourth-year journalism student and Hotwheels’ founder, created the club after he could not find one that met his interests in cycling and physical fitness. “My idea was to get more students involved in cycling and to promote it as a lifestyle choice and also to balance the lifestyle of cramming sessions,” said Struve. The idea for club was born out of Struve’s new-found passion for cycling, which he only took up in 2008. “It became something that I was good at, and with my competitive nature, it drove me into seeing how far I could go. It became something I want to pursue as a competitive sport,” he said. As he became more involved in cycling, he looked for new and bigger challenges, which led him to the Ride to Conquer Cancer. The thought of riding 300 km, from Vancouver to Seattle, in two days, was enough to get him hooked on the sport. And once he found out about the challenge of raising money for cancer, Struve had another reason to keep pedaling. After completing the ride for two years in a row, Struve described crossing the finish line as involving a lot of tears. “Emotionally it’s difficult to describe because you are a little overwhelmed by everything, but I would probably describe it as joy mixed in with sheer surprise,” he said. Struve’s new challenge is to get more Kwantlen students involved in raising money to fight cancer by riding their bikes. The Hotwheels club is meant for anyone interested in cycling, from beginners to seasoned vets. And Struve hopes that through the club, more people will become interested in the Ride to Conquer Cancer. The club currently has 15 members and Struve hopes it will continue to grow. Beyond getting students involved in cycling the club plans to hold a cycle-thon and bake sale to raise money for the Ride to Conquer Cancer. Struve also hopes to run a bike safety and basic maintenance workshop for people involved in the club. Joining the club free and members can participate in weekly rides and events planned for the future.